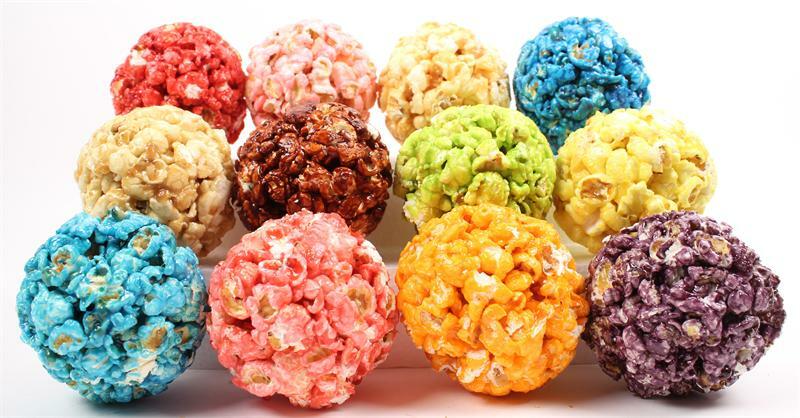 Popcorn Balls are cute, nostalgic, and can be made in any color and any flavor you can imagine. Having a beach theme party, use them as decoration on the table with large clam shells and you can make them look like pearls. If you have a kids theme party go for primary color and flavors like Cherry, Blueberry, Lemon, and Orange. If you are having a wedding reception put them in a tall vase in the center of the table and stack about 6 of them. You could do the Caramel Sparkle (gold glitter) for that glimmer that would look very romantic next to some candle light. If you are having a candy bar at your party use a large glass container and fill with popcorn balls. Do white Old Fashioned Sugar Corn and everyone will be thanking you all night long. Fun and nostalgic Perfect for a wedding or any family get together. Sometimes a stroll down memory lane is most definitely worth the price of the popcorn. Kernel Encore makes 300 different flavors of Gourmet Popcorn and we create more all the time. We can make popcorn taste like S’mores, Hickory Smoked Chicken, Hot Wings, Caramel, Lemon, Key Lime Pie, and B.L.T just to name a few. But chocolate is still chocolate. You can make it look like a swan, or melt it for a fountain, or make it look like the afore mentioned pig but it still tastes like chocolate. 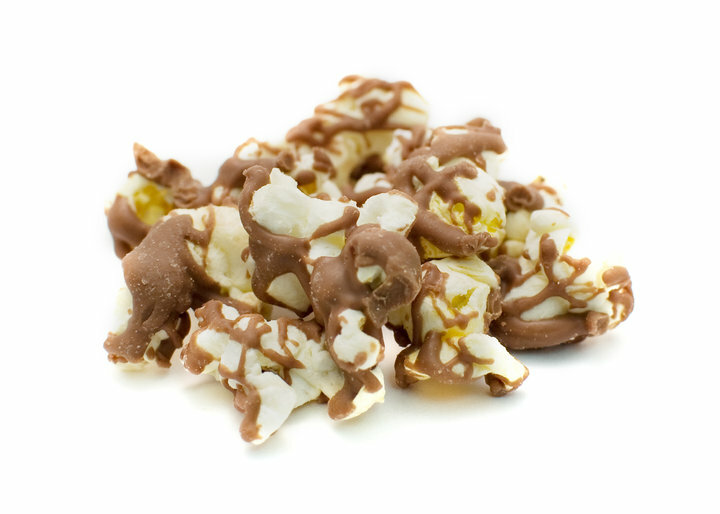 Don’t get me wrong, every now and then chocolate is Great, but pair it with Gourmet Popcorn and then you really have something. Perfect for snacking when you want that chocolate and salt combo. You know we have all done that, after all why do you think they sell M & M’s at the movie theater. BTW the biggest seller at the movie theater is the POPCORN, not the chocolate. So if it’s chocolate you are craving , get some that is already paired with that salty crunchy favorite you LOVE. Milk Chocolate Drizzle is that elegant must have for any wedding or party. Beautiful in a glass bowl as the center piece on the table. Place it in a tall vase on every table at the reception for a “little get to know you table mates and thanks for coming, by the way we will have dinner in a little while” kind of snack. Why the Kernel makes the Difference. You might think popcorn is just popcorn, but you would be wrong. Here at Kernel Encore we understand that popcorn can be an art form. Delicious to eat and Beautiful to look at. It may be a wedding, birthday party, graduation or just for snacking, and every time Kernel Encore out shines the rest. There are a lot of popcorn stores on the web, and I am sure it is hard to make a decision when everybody says the same thing, but I can say consistently the information you read on their sights and the flavor titles they use and sometimes the pictures they use come from Kernel Encore. It is flattering to be copied, but as any woman will tell you, we never want to see any one else in our dress. Kernel Encore has been put up in taste test, after taste test with just about every popcorn company, and we are proud to say we win every time. Why? We use chefs, with degrees to create our flavors. We give them the freedom to create and experiment to come up with that one of a kind flavor. We use exotic spices and extracts to make our popcorn amazing, some all the way from China. We also use different types of specialty corn. We are not cheap, but we are that good. So in conclusion try Kernel Encore and you will never look for a different popcorn company. The Best Popcorn Starts With the Kernel! Give little gifts of Kernel Encore Gourmet Popcorn at your rehearsal dinner to say Thank you. Easy and elegant. This is a theme you can glam up or make casual. From Champagne with silver Sparkle for the Silver Screen to traditional Theater Style that everyone loves. The scene is up to you. Now… Action! Dresses are being purchased and churches and halls are being reserved. When thinking about your event, keep in mind if your event will be elegant, or casual. How will your guests be dressed and what kind of food will you be serving. What kind of setting will you have, rustic or classy. Will your event be at night or in the afternoon? Will it be indoors or outdoors or a combination? All of this should play into the flavor decisions you make. Elegant, candle light, indoors would lead you to choose Champagne Sparkle, White Cheddar, Original Kettle Corn, or French Vanilla. Outdoor, late afternoon, rustic might be Caramel, Cheddar Cheese, Toffee or Barbecue Kettle Corn. The time of the year and seasons also play into the selections you might make. July event might be Apple Pie, Firecracker, or Peach Cobbler. An October event might have Caramel, Pumpkin Pie, Vanilla Cream (in fall colors) or Butter Nut Crunch. Call 1-888-767-7678 to speak with Victoria about any flavor or event questions you might have, or email her at Victoria@KernelEncore.com. She would be happy to help you anytime. Here is a video of Kernel Encore’s Pink Sparkle. Popcorn – Something for everyone. 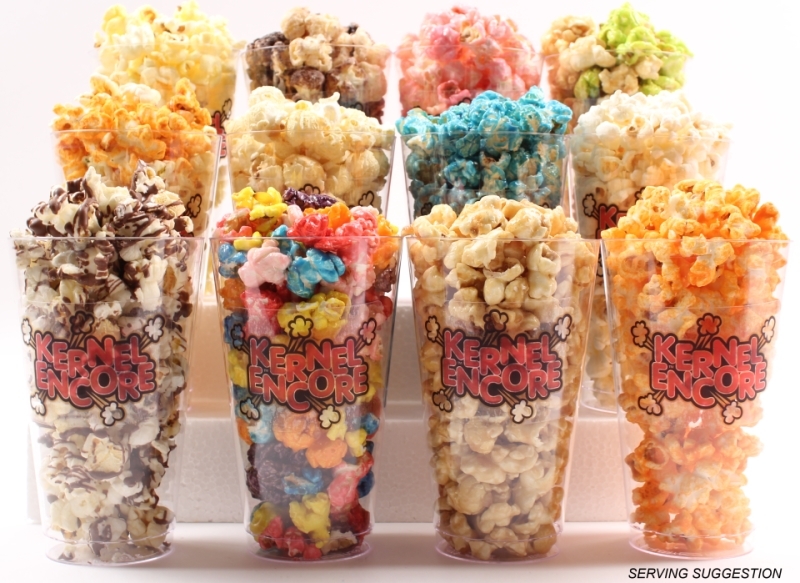 Kernel Encore makes over 300 Gourmet Flavors of Popcorn, more than anyone and better than all the rest. We pride ourselves on having flavors that are created by chefs and are handmade. Most other popcorn companies make their popcorn how the manufacturer of the equipment tells them too and uses their recipes. Not Kernel Encore. We want to give you the best and take the time to create flavors that we love and know you will too. That is why not just other popcorn companies, but big potato chip makers like L**s and others have the same name on their chips as we have on our Gourmet Popcorn. Don’t be fooled. We have been around for about 15 years, so ask yourself what came first the kernel or the flavor? Try Kernel Encore, there is no substitution for the best. Other popcorn places can sell it cheaper, because they do not use the high quality of ingredients that we do. If you are planning a wedding or a party, use the best! We all want everyone to leave your event saying, wow that bride was beautiful and the popcorn was AMAZING or great event, spectacular party, and AMZAZING popcorn. We want you to be the star of the show but even the stars need co-stars. We invented and perfected the Sparkle Popcorn. When Donald Trump wants popcorn he calls Kernel Encore and you should too. The Best Popcorn Starts With the Kernel. 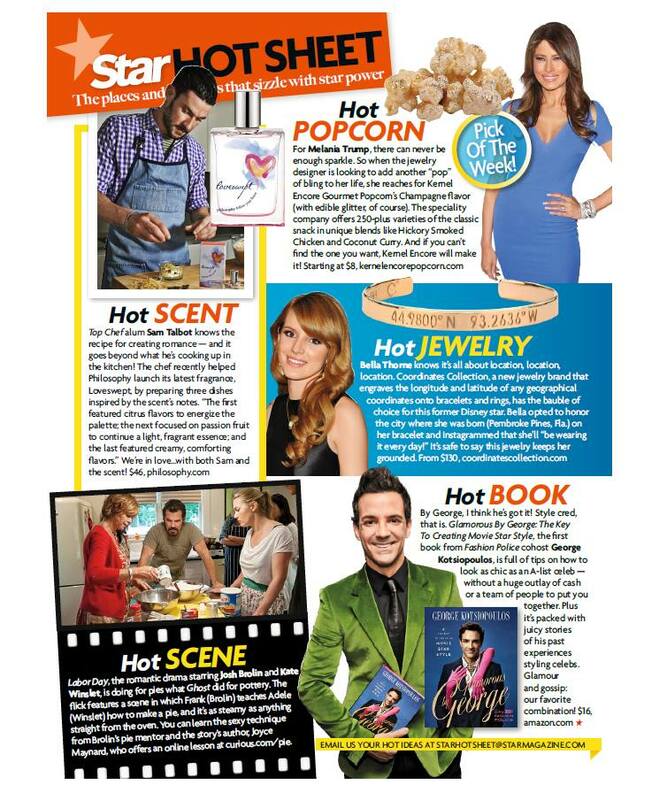 Kernel Encore’s Champagne Sparkle is Featured in Star Magazine. Check out other wedding ideas and post pictures of your own wedding. We love hearing from you all.